I wasn't born with gorgeous brows. They've always been somewhat thick, but not in a cute way. I tweeze and tweeze some more. I was so upset these last few days because I lost my favorite pair. My brows were looking like a hot mess for a while. I jumped at the opportunity to review this set. And it came with 3 different pairs! There is one for ingrown hairs, slanted tip ones, and a pair of regular ones. It came in a really pretty sparkly purple case. The case securely closes with velcro, when not in use and is small enough to fit into a small purse or pocket. It's just the right side for travel. 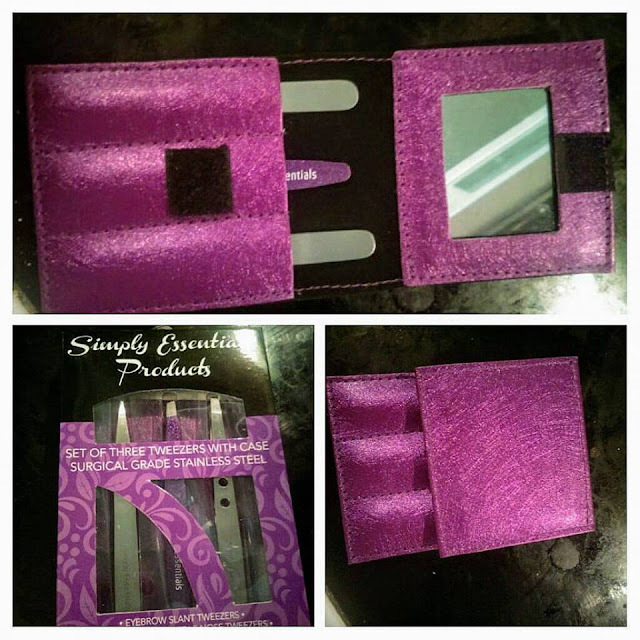 There is also a mirror inside of the purple case. Even better, right? I love that one of the pairs of tweezers is the same color as the case. That purple is just so pretty. As you can see in picture, the tweezers are surgical grade stainless steel.